Trains are fast and efficient, they can carry a lot of people, they’re extremely convenient, and in Japan, they’re the go-to for transportation. While we stayed in Tokyo, we rode the train every day, and for the most part, it was a very pleasant experience. With the sheer numbers living in and around the Tokyo metro area, driving simply isn’t practical. Many walk (and we certainly had our fair share of that as well! ), and you’ll see them running down the sidewalks in their business suits. But when longer distances are required, a station is never far away. We had one across the street from our hotel – in fact, the train passed just outside our window. Each morning, we’d make our way into the crowded station, up the escalators (keep to the left! ), and onto the platform for the Yamanote line. Stations are insanely busy, especially during rush hour (which is why we avoided it whenever we could). It was difficult to stay out of the way when we didn’t know where we were going; needless to say, we learned our way quite quickly. Hint: Yellow signs mean exits. Green means JR. Men’s rooms are blue; women’s are red. Colors are your friend. Japanese trains are renowned for their reliability – to the point of spawning stories that operators have to issue notes to disbelieving superiors if a delayed train makes a worker arrive late. 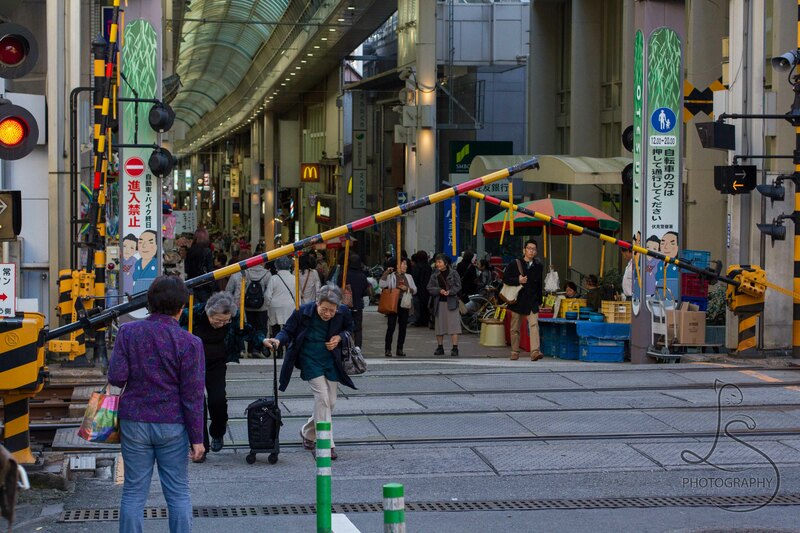 It is for this reason that trains see over 40 million passengers each day in Tokyo, alone. For reference, that’s more than the population of the entire state of California – every day. Despite the crowds, the Japanese have trains down to a science. The map for the lines is enough to make any American run and cower, locking themselves inside their sedans and minivans and vowing to never travel by any other means. But if you take the dive, the mass of colored spaghetti can be conquered. Can you find the oval? 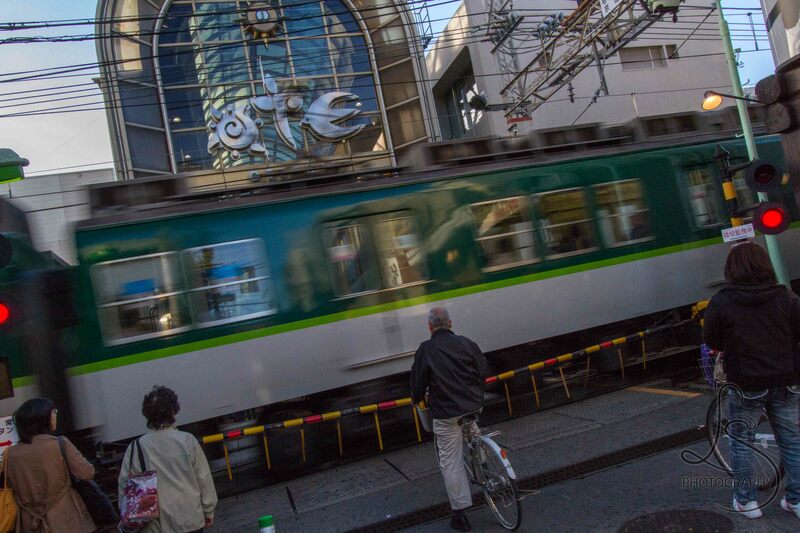 That was our go-to Yamanote line. We purchased a JR pass ahead of time, and this let us ride unlimitedly for our two-week duration; we made full use of it. From Akihabara to Yokohama, Mitaka to Shibuya, we went everywhere.. and trains were there to take us. Even late at night! We were surprised to find trains are busier at 10pm on a Tuesday than 9am on a Saturday (and the riders far more lively!). The queuing system is brilliant. Paint on the floor guides waiting passengers into lines angled away from or to the side of the arriving train doors. Departing travelers can then leave unhindered, and the queue files in behind. We somewhat frequently ride our local light rail, and we desperately – desperately – need a system like this; most don’t understand the concept of letting folks off before trying to board. We also admired the clever use of advertising space in the stations. Why not? But more than anything, we loved the tones. Cute, uplifting. Announcing arrivals, departures, and general messages. We looked forward to going to the stations for these tones, and hearing them now makes us miss Japan. We had to hit Shibuya Station while we were there – the busiest station in the world. And I believe it! As a tourist, the masses of people were simply mind-boggling. It was mesmerizing watching the throngs flow, deftly weaving through opposing crowds, and dissolving onto the opposite curb. Even bicycles somehow survived the wall of people! When the light changes, pedestrians rule here; we saw a wayward bus get stranded in the sea of people when it didn’t clear the intersection in time. We must have watched the waves from the station for an hour. They simply never dissipated. Our JR pass also allowed us onto the Shinkansen when we hopped between Tokyo and Kyoto, and that was an experience in itself! Looking like something out of a futuristic sci-fi movie, these trains really cook (we clocked ours at over 160mph). They also happened to be quite comfortable. Yes, we experienced a sardine-packed train (though we at least avoided the dreaded white gloves packing everyone in; it wasn’t that crowded). Yes, we had to have a native show us how to enter a wicket. Yes, we got on a wrong train. And yes, we hopped on without a destination in mind, getting off at a random stop. But it was all part of the amazing adventure that is Japan!